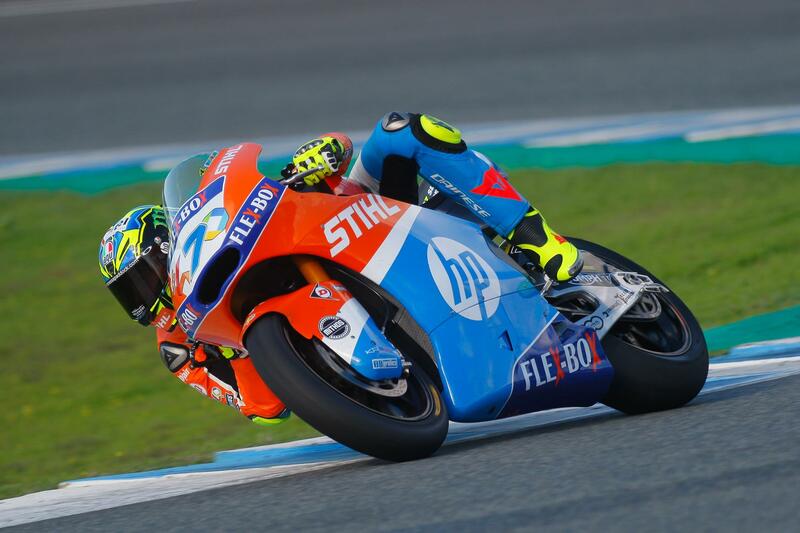 Lorenzo Baldassarri has topped the first day of Moto2 testing for 2019 at the Circuito Jerez, but it's reigning Moto3 champion and Moto3 rookie Jorge Martin who stole the headlines after he crashed - and was left with a cracked left humerus and some broken bones in his foot. That means he'll be sidelined in order to recover, with his first taste of the middleweight class cut short for now. He did make a solid impression before that and was inside the top 15, however, but a 1:42.203 from Baldassarri in the final session of the day then changed the goalposts as the Italian beat compatriot Luca Marini to the top. The test signals the beginning of a new era not only for the rookies like Martin, but also of Triumph power - as well as some updates in the technical regulations. And it's off to a good start, with Baldassarri getting within three tenths of his 2018 pole lap at the track. Behind him and Marini, the man in third was another man with a good record at the track: Sam Lowes, as he returns to the Federal Oil Gresini squad. The Moto2 riders completed four sessions throughout the day, with conditions improving in the afternoon after overnight rain had seen a damp start to proceedings. At the end of day one, Pons HP40’s Augusto Fernandez was fourth fastest, with Remy Gardner rounding out the top five – 0.533 off the top. The fastest rookie was Nicolo Bulega, the Italian setting the seventh quickest time of the day to finish 0.566 from first – a great debut for him. 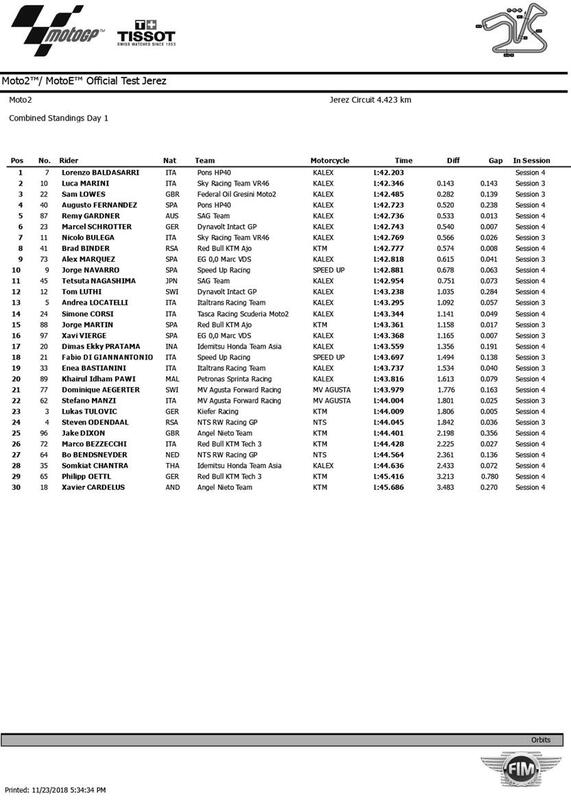 Martin was next quickest rookie, in 15th, with Fabio Di Giannantonio 18th on the times. He was just ahead of fellow rookie Enea Bastianini. Elsewhere, Jake Dixon’s Moto2 debut ended with the British rider setting a quickest time of 1:44.401, 2.198 off Baldassarri’s benchmark, with Dixon finishing one place ahead of Moto3™graduate Marco Bezzecchi, 25th and 26th respectively for the pair as they settle in.